Jianjian and Kangkang celebrated their first birthday yesterday. Macao's twin panda cubs Jianjian and Kangkang celebrated their first birthday yesterday and their party pictures are here to make you smile. 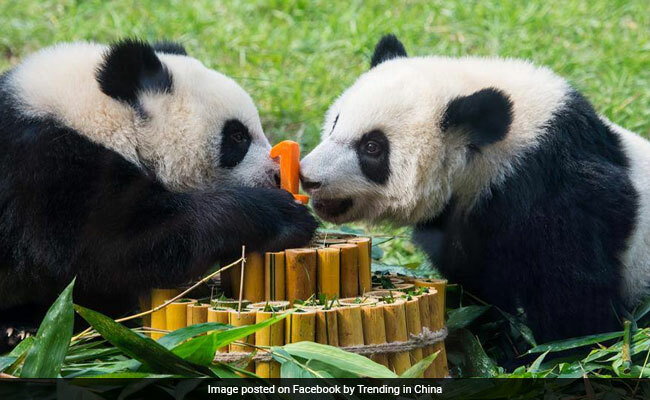 The adorable panda cubs celebrated with a cake made of bamboo as visitors sang 'Happy Birthday' for them from outside their glass enclosure, local reports state. This was the first time that the cubs met the public with their mother, Xinxin. According to cctv.com, the twins were born on June 26, 2016, to Xinxin and a male panda named Kaikai. Xinxin and Kaikai were chosen from Chengdu Research Base of Giant Panda Breeding in China as a gift of the central government to Macao Special Administrative Region.